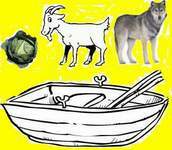 A wolf, a goat and a cabbage must be taken to the other side of the river. You have a boat, which is not large enough to take more than one of them. If you leave the wolf with the goat, the wolf will eat the goat. If you leave the goat with the cabbage, the cabbage will be eaten. How to get the three across the river?